Stealth Cam E38 Digital Scouting Camera with 8.0 Megapixel (3 resolution settings)8MP/3MP/1.3MP / HD Video recording, 5-300 seconds with audio; Time Lapse Function; 38 IR Emitters, 50 foot range; 6 button EZ programming; Quick Set; Burst Mode 1-9 images per triggering; 5-59 seconds, 1-60 minute recovery time out; Side-mount external LCD display; Time, Date, Moon Phase, Temperature; SD Card slot up to 32GB; Test Mode; Low Battery indicator; USB output; Operates on 8 AA batteries (not included). Stealth Cam, introduced in the year 2000, quickly became the leader in scouting camera innovation. 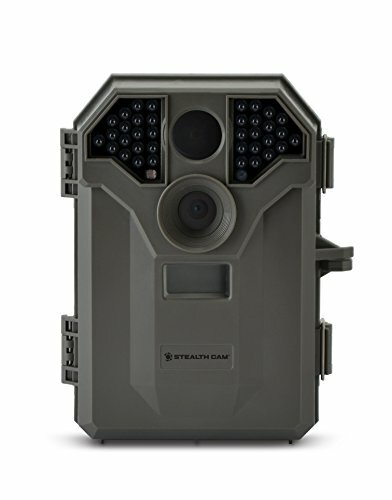 Continuing to take technology to the next level, Stealth Cam introduces the next generation of feature-packed scouting camera for 2015, the G42C. 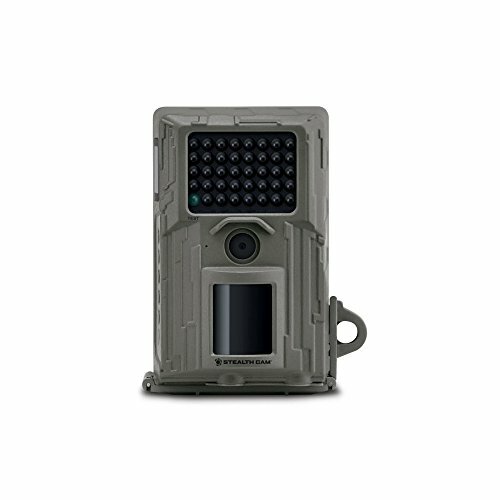 This 8 Megapixel- 4 resolutions; 10mp, 8mp, 4mp and 2mp integrates 30 IR emitters with an 80-foot range making it great for land management professionals and hunters tracking potential trophies. The G42C embodies the essence of the Stealth Cam idea: it combines pedigree camera technology with excellent everyday utility and maximum performance with minimum consumption. 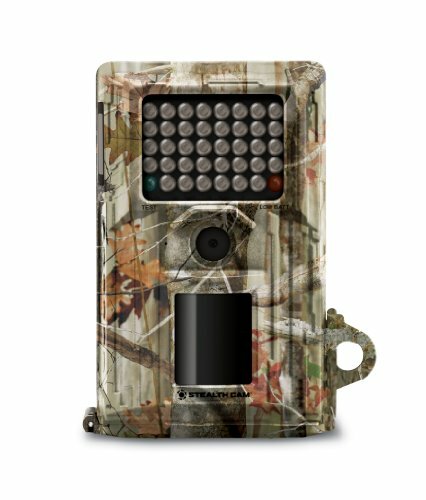 The task faced by the development team was to create a game camera for the next decade with a highly efficient and powerful hybrid program. This led to the creation of colored day/night images and videos in assistants to the Matrix advanced blur reduction, Retina low light sensitivity and a super quick Reflex trigger. The white LED illumination provides color at night and has a range of 80 feet. An intuitive backlit menu program and quick set pre-program allows for easy operation of the G42C. The camera stores a 32GB SD card and has a secure lock password offering additional protection from unwanted hands. Developing the G42C from other successful stealth models, allowed the team to come up with a no-compromise concept. 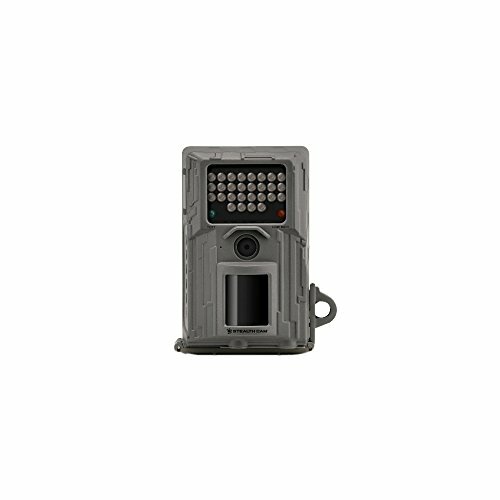 The game camera therefore demonstrates HD video recording 5-180 seconds w/audio in 16:9 wide image ratio, a burst mode of 1-9 images per triggering, 5-59 sec/1-59 min recovery time out and time/date/moon phase/temperature/name stamp. Additional performance features of the camera are GEO-TAG GPS Tagging, allowing users to track their camera locations and multi-lingual options. In short, the G42C will act as the role model for the game cameras of the future. 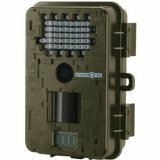 Stealth Cam G42 No-Glow Trail Camera is a part of the high quality and dependable Trail Cameras from Stealth Cam. All of the features you need for a price you want. 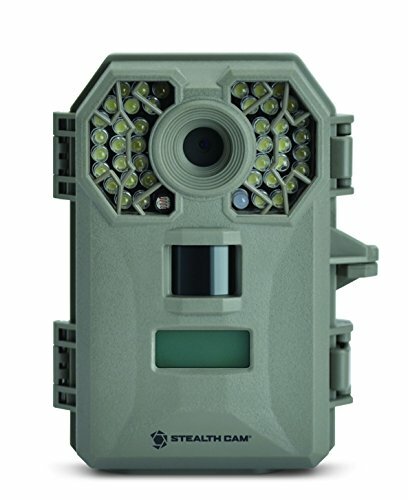 Trail Cameras from Stealth Cam are well known for their quality and Stealth Cam G42 No-Glow Trail Camera upholds that standard. The STC-G42NG take a standard Mini-B USB. Stealth Cam with TRIAD 10.0 Megapixel Resoluion(4 modes 10mp/8mp/4mp/2.0mp), HD Video recording 5-180 seconds with audio, Time Lapse with PIR Override/ Reflex Trigger; 42 'BLACK' IR Emitters; 100 foot range; Intuitive backlit menu programming; Matrix Advanced Blur Reduction; Retina Low Light sensitivity; 16:9 Wide Image Ratio; Quick Set pre-programmed option; Burst Mode 1-9 images per triggeringl; 0-59 seconds, 1-59 minute recovery time out; Time / Date / Moon Phase / Temperature / Name Stamp / GEO-TAG GPS Tagging; Manual shot capability; Secure Lock password protection; SD Card slot up to 32GB; Test Mode; USB output; Operates on 8 'AA' batteries or External power jack for 12V battery box; Durable weather proof housing; 5.5"H x 4"W x 2.5"D.
The E28 is a 7.0 Megapixel camera with three resolutions: 7.0mp, 3.0mp and 1.3mp and equipped with 28 IR emitters with a 50-foot range. The E Series is TRIAD armed with the 3-in-1 technology of video, still and time lapse. The performance upgrades on the E Series include ZX7 Gen 2 Processor creates faster trigger speeds to help capture those fast moving bucks chasing does through your favorite hunting spot at sub-second trigger speeds with the Reflex Trigger. Hunters that have experienced the frustration of checking their game cameras only to find the batteries to be dead will be pleased to learn of the increased image count per battery life. Beyond the fast trigger speeds and efficient battery life, the E Series has even more features being offered as part of this new technology, such as High Definition Video with data time code stamping, a great tool for editing footage plus time-lapse hybrid mode giving you virtually three cameras in one complete package. Programming the E Series Stealth Cam is easier than ever before with the new 6-button EZ programming. The Quick Set feature has three Preset modes, along with the manual set-up mode, saving frustration as you get your gear into the field. The new UNIT is a micro-sized trail camera that is easy to conceal in the woods. Its small size and lightweight aids in the ease of transporting the camera into the woods for set up, fitting perfectly into a backpack. Beyond its micro-sized package, the UNIT contains a number of new features that allow it to compress video much more effectively than ever before. It provides greater flexibility for applications to a wide variety of network environments. 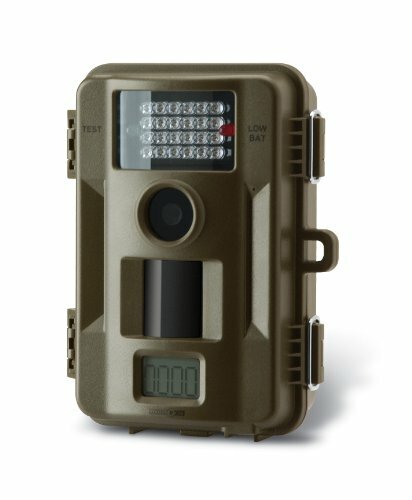 The UNIT 7 is 640x480 video trail camera with audio capabilities, recording 10-180 seconds of footage. Not only will you be able to see deer activity, you can hear it! The UNIT 7 includes Digital Video Stamping. This allows the user to review the time-coding of the captured video by monitoring the time, date, temperature, and the moon phases of the footage. The UNIT 7, with its newly advanced optical technology truly becomes the ultimate scouting tool for the hunter looking to maximize his time in the field by monitoring deer activity 24/7. The 7 MP still image capability provides high resolution, clean, crisp photos of activity on your hunting location. The UNIT 7 accepts up to a 16GB SD card. There is plenty of time to capture footage to review the game activity. The nighttime images captured by the UNIT 7 are made possible through the use of the 24 IR (infrared) emitters with range control. The new microprocessor optimizes trigger time and when utilizing the patented Burst Mode Technology, trigger gap time is also reduced. Speaking of Burst Mode, the UNIT 7 captures between one and nine images per triggering. The Unit 7 offers USB output and operates on 8 AA batteries and available external power jack for 12V battery Box (sold seperately). The E38NG is a 8.0 Megapixel with three resolutions: 8.0mp, 3.0mp and 1.3mp and equipped with 38 'No Glow' IR emitters and a 50-foot range. The E Series is TRIAD armed with the 3-in-1 technology of video, still and time lapse. The performance upgrades on the E Series include ZX7 Gen 2 Processor creates faster trigger speeds to help capture those fast moving bucks chasing does through your favorite hunting spot at sub-second trigger speeds with the Reflex Trigger. Hunters that have experienced the frustration of checking their game cameras only to find the batteries to be dead will be pleased to learn of the increased image count per battery life. Beyond the fast trigger speeds and efficient battery life, the E Series has even more features being offered as part of this new technology, such as High Definition Video with data time code stamping, a great tool for editing footage plus time-lapse hybrid mode giving you virtually three cameras in one complete package. Programming the E Series Stealth Cam is easier than ever before with the new 6-button EZ programming. The Quick Set feature has three Preset modes, along with the manual set-up mode, saving frustration as you get your gear into the field. 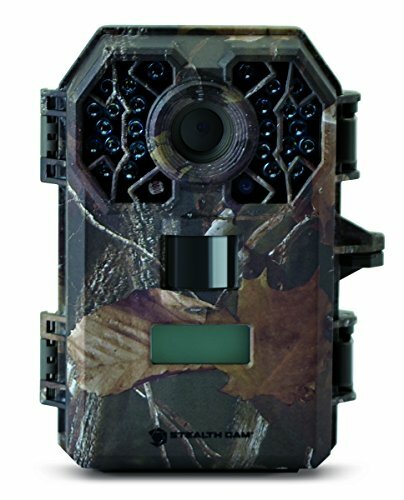 Stealth Cam Unit X Digital Scouting Camera with Camo finish... ZX7 Processor / TRIAD TECHNOLOGY - 8 , 3 or 1.3 MP Images or HD Video Recording in 10 to 180 Seconds with Audio or Time Lapse Function; Quick Set; 38 IR Emiiters for up to 50 ft. range; Burst Mode 1 to 9 Images per triggering; 5-59 Second or 0-59 minute recovery time out; External LCD status display; Time / Date / Moon Phase & Temperature Stamping; SD Card slot up to 32GB; Test Mode; Low Battery indicator; Video output; USB output; Operates on 8 AA batteries; External power jack for 12V battery box. The G26CMO is Stealth Cam's most technologically advanced, state-of-the-art, 8.0 Megapixel camera with three resolutions: 8.0mp, 4.0mp and 2.0mp. It incorporates 26 IR emitters with a 70-foot range. The G26CMO also sports Stealth Cams state of the art "Stealth Camo" to help it blend in naturally with whatever environment it's used in. 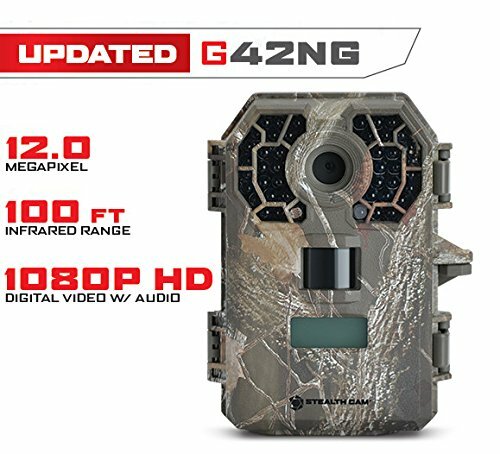 The G Series is engineered in the US and incorporates Stealth Cam's new look, encompassing their all-new software innovations and rugged, compact body housing, letting hunters know when they purchase Stealth Cam, they have the latest technology available on the market. The new G Series compact scouting cameras will embody Retina Advanced Low-Light Sensitivity, Matrix Blur Reduction Technology, Reflex.75 second trigger speed, Multi-Zone Detection, Geo-Tag, Secure Lock Digital Protection, and Energy Efficient Design. Those are all in addition to their current pioneering technology portfolio of TRIAD 3-in-1 Technology, HD Hi Definition Video, Quick Set - fast simple setup and Burst Rapid-Fire Mode. Going beyond the fast trigger speeds and efficient battery life, the G Series has even more features, such as HD High Definition Video with data time code stamping, a great tool for editing footage plus time-lapse with PIR Override mode, giving you virtually three cameras in one complete package. Still, Video and Time-Lapse! The PIR Override will still capture an image if the subject walks by while in time-lapse, ensuring nothing is overlooked in the woods. The Retina and Matrix technologies work cohesively to evenly illuminate the subject area, which captures clearer images up to 70 feet, while the Multi-Zone Detection feature captures subjects on the perimeters. The E38 is a 8.0 Megapixel with three resolutions: 8.0mp, 3.0mp and 1.3mp and equipped with 38 Clear IR emitters and a 60-foot range. The E Series is TRIAD armed with the 3-in-1 technology of video, still and time lapse. The performance upgrades on the E Series include ZX7 Gen 2 Processor creates faster trigger speeds to help capture those fast moving bucks chasing does through your favorite hunting spot at sub-second trigger speeds with the Reflex Trigger. Hunters that have experienced the frustration of checking their game cameras only to find the batteries to be dead will be pleased to learn of the increased image count per battery life. Beyond the fast trigger speeds and efficient battery life, the E Series has even more features being offered as part of this new technology, such as High Definition Video with data time code stamping, a great tool for editing footage plus time-lapse hybrid mode giving you virtually three cameras in one complete package. Programming the E Series Stealth Cam is easier than ever before with the new 6-button EZ programming. The Quick Set feature has three Preset modes, along with the manual set-up mode, saving frustration as you get your gear into the field. The P36NG is an 8.0 Megapixel compact scouting camera, with a 40 foot range designed to capture wildlife activities. The P36NG is also designed with security in mind, and is a perfect option for those on a budget. Featuring 36 "NoGlo" LED's, this camera will not produce any visible illumination when it takes a picture or video. Whether you're chasing that wary old animal, protecting your home, or simply monitoring access to your property, the P36NG is perfect for all applications. It is equipped with an Energy Efficient design, Burst Rapid Fire Mode and Quick Set for fast and simple set up. With less time available for scouting, many hunters trust their scouting cameras to aid in this time intensive activity. Hunters that have experienced the frustration of checking their game cameras only to find the batteries to be dead will be pleased with this new Energy Efficient Design and time saving set up. Beyond the Burst Mode feature that delivers 1 to 6 images per triggering, this little gem is equipped with a mini USB output for quick downloading capabilities in the field. Programming the P36NG Stealth Cam is easier than ever before with the easy Quick Set dial that has three Preset modes, along with the manual setup mode, preventing frustration as you set up your gear in the field. This 720P high definition digital video with audio scouting recorder features 8.0 megapixel, 3mp, 1.3mp. 5-300 Second adjustable video clips. 54 IR emitters for 60’ range. Records both color and black/white HD video. Burst mode shoots 1-9 images per triggering. Time/date/moon/temp stamp on video/still files. Test mode. 64 MB built in memory. SD memory card slot accepts up to 16 GB. 12V auxiliary power jack. 1-59 second/0-59 minute recovery time out. A/V output. Operates on 8 “AA” cell batteries.